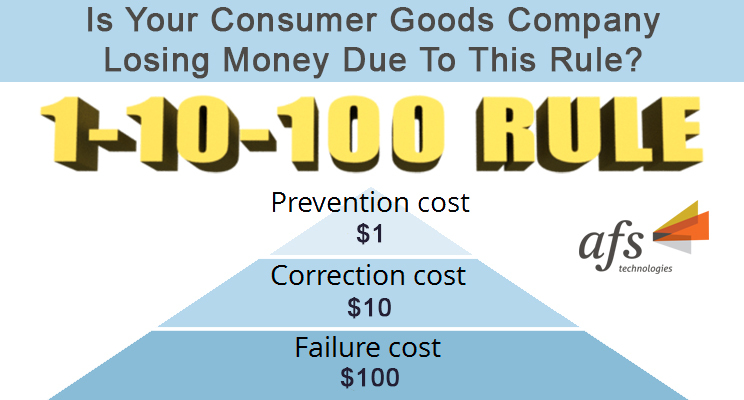 Home ERP Is Your Consumer Goods Company Losing Money Due To This Rule? The rule explains how failure to take notice of one cost escalates the loss in terms of dollars. The 1-10-100 rule concept when applied to controlling the costs associated with software development and deployment, states; that it costs one unit of labor resource dollars to correct an issue at development (prevention); it costs 10 units to fix an issue when found at (QC) quality control (correction); and it costs 100 units to fix an issue after the system or product has been implemented with a customer (failure). At AFS, we are cognizant of the 1-10-100 rule and apply it in the development of our purpose-built software, which for our clients, ultimately saves them millions of dollars. We look to see if there are significant inefficiencies that could be addressed with technology to reduce costs and improve an organization’s visibility into their data. Technology plays such an important role for consumer goods companies, helping to automate processes as much as possible. To be effective, it’s important that an organization doesn’t try to ‘reach for the moon’ but instead, focuses on the practical use of data based on its importance to the business. Effectively utilizing technology can have a significant impact on an organization’s ability to gain critical visibility into its data, drastically improving the efficiency of decision-making related to how data is stored, managed, and utilized effectively. The 1-10-100 rule must be considered when implementing business software, especially software that is either customized or configured for your business. AFS solutions are purpose-built for consumer goods companies to save distributors and manufacturers money and increase the ROI of their businesses. Especially with software that is purposed for that last mile, it is crucial that you have a partner that clearly understands this pivotal point of business and can drive efficiencies through the planning and execution processes. AFS Technologies has been developing purpose-built software for the last 31 years and has a local and global footprint that has saved companies billions of trade dollars. If your business is looking to drive efficiencies throughout your organization, then you must consider AFS when looking at planning and execution software that will aid your business throughout the supply chain.